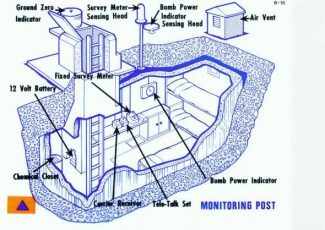 Diagram of ROC Monitoring posts. 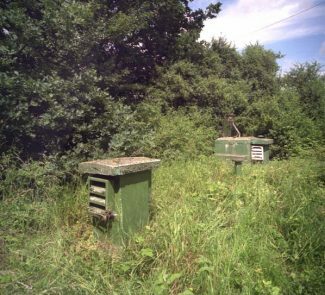 Great Burstead ROC post photographed in 1997. 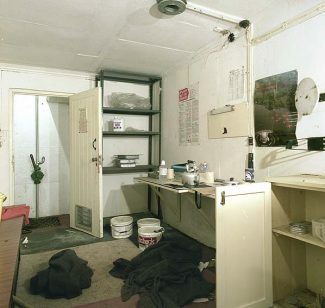 Interior in 1997, the ventilation pump and BPI dial can still be seen. Beneath the fields that line the northern edge of Church Street and within sight of Great Burstead church, lies buried 14 feet below the ground, a secret few people living nearby knew about, and yet it was a vital part of the defence of this country, an underground nuclear bunker that is still there to this day. 60 years ago, there was a fear gripping the whole western world, the cold war had begun; that period of East-West mistrust and suspicion that dominated International relations from the end of WWII, until the collapse of the Soviet Union in 1991, and which led to a real and palpable fear of an attack on this country by nuclear weapons. As part of the defence systems of the UK, a complex system of more than 1560 United Kingdom Warning and Monitoring Organisation (UKWMO) underground warning and monitoring stations were constructed across the country between the mid 1950’s and the early 1960’s, until the stations were abandoned in 1991. 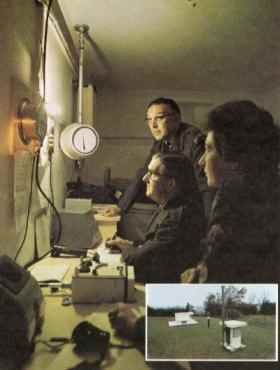 The posts were usually manned by Royal Observer Corps (ROC) volunteers. The monitoring stations were built to a standard design consisting of a 14-foot-deep access shaft, a toilet/store and a monitoring room. Construction of the original 1,563 posts was overseen by the Air Ministry Works Department and the ROC and undertaken by local contractors. A hole approximately 9 feet deep was excavated. Within this hole a structure was cast using re-enforced concrete with a floor about twelve inches thick, walls about seven inches thick and a roof about eight inches thick. The whole structure was then bitumen ‘tanked’ for waterproofing. Soil was compacted over the structure to form a mound leaving the access shaft, doubling as an air shaft, protruding above ground. At the opposite end of the building there was a further air shaft. Two metal pipes, one 5 inches in diameter and one 1 inch in diameter protruded from the roof and above the four-foot mound to be used with operational instruments. The air vents were covered by downward-sloping louvres above ground and sliding metal shutters below ground to control air flow during contamination by radioactive fallout. The ROC posts were primarily staffed by local volunteers, who would conduct regular training drills, and be on standby in the event of a nuclear threat. In the event of a detected incoming nuclear attack, the air attack warning siren would be sounded at the nearest police station the ROC post would also warn the local public of a impending nuclear blast by letting off flares. Bomb Power Indicator or BPI a dial that would register when the pressure wave from a nuclear explosion passed over the post. When related to the distance of the explosion from the post this pressure would indicate the power of the explosion. The Ground Zero Indicator or GZI consisted of four horizontally mounted cardinal compass point pinhole cameras within a metal drum, each ‘camera’ contained a sheet of photosensitive paper on which were printed horizontal and vertical calibration lines. The flash from a any nuclear detonation would produce a mark on one or two of the papers within the drum. The position of the mark enabled the bearing and height of the burst to be estimated. With triangulation between neighbouring posts these readings would give an accurate height and position. The altitude of the explosion was important because a ground or near ground burst would produce radioactive fallout, whereas an air burst would produce only short distance and short lived initial radiation (but no fallout). Sixty seconds after any reading on the BPI an observer (rather bravely) exited the post and changed the GZI cassettes. The exposed papers were returned underground for assessment. The pre-exposed papers had a graticule grid exposed on the papers that showed degrees of bearing. The fireball from any nuclear burst within range would have burned a mark on the paper. The spot size and bearing would be reported to the group control together with an indication that the spot is touching or clear of the horizon, essential for indicating an air or ground burst. Information from the post and it’s neighbouring posts (South Woodham Ferrers, and Vange) was co-ordinated at Colchester regional control bunker. The Great Burstead ROC post was constructed beneath the field north of Church Street close to the junction of two footpaths in August 1963, and was closed in September 1991. Very few people locally knew of its existence, but it would be Interesting to hear from any of the Volunteers. With the end of the cold war, the ROC were cutback in 1991, and finally disbanded in 1995. I remember being at Billericay School in the early 80’s & we walked to the location at Little Burstead on the S bend opposite the church to check it out after someone’s grandparents had made us aware of it. It was very much in use then as we got stopped by a guy (not sure who he was) as we approached it who told us to turn around & leave the land immediately. Being about 13 at the time we did exactly that as we weren’t sure what we were walking into. Think we’d just watched Threads on TV so anything Cold War orientated was the topic for conversation.. It is in Little Burstead, as shown on local footpath maps. Near the Church in Rectory Road. Visited the site today and it is locked (very securely too) as stated. There seem to be some other adjoining buildings, complete with a particularly large sounding dog onsite somewhere, I assume all belonging to the owner of the post, has anyone got any clue as to who it is and how they could be contacted for a look inside? The bunker is securely locked and there is no access. You can just see the two square boxes sticking above ground as in the photograph. Is it available to the public say to explore it? The site at TQ67809232 has no obvious remains of the post. This location is just north of St Mary Magdelene in Church Street Great Burstead. The surviving underground post is at TQ669915 which is close to just of Rectory Road, Little Burstead on the other side of the road from St Mary the Virgin. Hello Helen, sorry for the delay in replying. the ROC monitoring post is at OS map ref TQ67809232 about 400 yards north of church street near to the junction of 2 public footpaths probably FP59 and FP168, near Well Farm. Please take a look and see if you can locate it. Where abouts exactly is the nuclear bunker?